Sweep in Peace is the second book in the Innkeeper Chronicles. For those who do not know, Dina is an Innkeeper, and Gertrude Hunt is her Inn. She takes in wayward travelers from other worlds, protecting human beings from knowing just how big their world really is—aliens, other planets and all. She is reluctant to say yes when approached by an Arbitrator who shows up on her doorstep, asking her to host a peace summit. She is desperate, however, with bills to pay and in need of the guests who will help keep Gertrude Hunt alive. All other inns have turned the Arbitrator down, a sign of just how dangerous and impossible peace between the three warring factions will be. Opening her doors to the Hope-Crushing Horde, Vampires and the Merchants of Baha-char, Dina takes her chances. It is a big task that she is not sure she is up to, but feels as if she has no other choice. Hiring a disgraced but talented chef, Dina does what she can to prepare and hopes her guests will not murder each other. 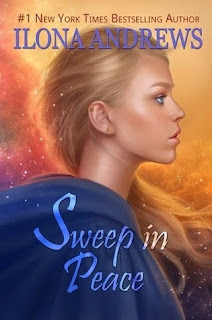 Sweep the Peace offered an even closer look at the world Ilona Andrews’ has created in their series. The three factions are fighting over a planet, having been at war for years with no end in sight. The death toll on all sides is high. The Horde and Vampires want complete control over the planet and the merchants want to establish a colony of their own as well as set up trade. All seems rather hopeless, and Dina is at a loss of what to do. Tension was even higher in Sweep in Peace than it had been in the first novel, and at times it got quite dark, given the subject of war and the strife. Some might suggest that fantasy or science fiction is too “out there” or not real enough, but it is often closer to reality than we may want to believe. Perhaps not in creature or character, but in overall message and conflict. And that would be true in this instance. I liked the “human” side that the authors provide in Sweep in Peace. A reminder of all that is lost in war. True to form, the book was lightened with humor inserted here and there (and more literary references, which I adored). I liked the various twists in this one, unexpected most of them, and appreciated the bond between inn and innkeeper even more. And, yes, you guessed right. I immediately went on to read the third book in the series. Sounds like a really fun book! I agree with you that fantasy and sci-fi can be very accurate in portraying realities of today's world! The setting may be "out there", but the conflict isn't. Eustacia - Exactly! There are definite themes that can be related to reality in books like these. And still fun reads! I think out of the three, so far, this might be my favorite. I enjoyed all the twists and getting to see the world better through the different factions. Great review! Berls - This one was very good! I liked getting to know a bit more about the different types of "people" out there. I, too, like the sound of this book and this author. And I agree that even though the 'setting' might be fictional, the message or theme can be really on point. I think that's true of all the genres. Kay - Yes, it can apply to just about any genre. I really enjoy these authors' work! With an author I've had recommended to me many times and its being lightened with humour and literary references I may well have to consider seeking out a copy of this series. Tracy - I hope you enjoy this series if you do decide to try it! I don't think I've read any negative reviews of Andrews ever! This sounds really good and I like that there's a bit of humor here. I just got the first book in another series by Andrews and I'm really looking forward to reading it. Katherine - I hope you enjoy their books when you read them! I really enjoy what I've read by this writing team.